The Olympic games are a big deal. Huge. Astronomical. They represent the world’s finest athletes, competing on a stage that’s seen by millions upon millions of people whose eyes stay glued to the TV for the entirety of each game’s duration. Or so NBC hopes. The ever struggling network forked over a hefty $2.3 billion for the rights to air this year’s Winter Olympics and the Summer Olympics in 2012. That was way over the $1.3 billion that Fox bid. NBC executives did this in 2003, long before the economy completely tanked. Now, due to lagging ad sales, the the network is prepared to lose upwards of $250 million. To be fair, some of the advance hype did end up helping. The ratings for the games have been way up (NBC even beat Fox’s American Idol a couple of times). 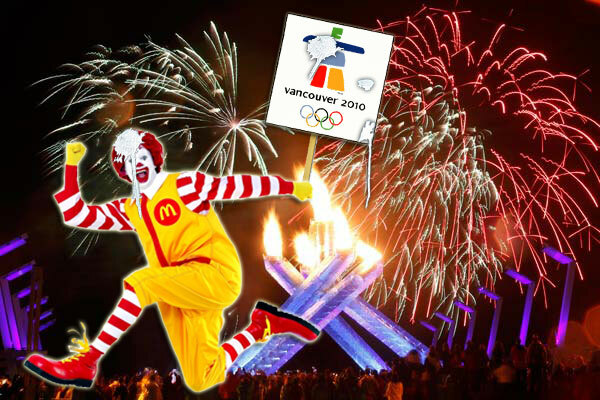 NBC isn’t the only company to want in on the cash cow that is the Winter Olympics. At least nine other companies have also forked over some big bucks (something in the $20 million range) for the chance to feature those iconic golden rings in their ads. That also ensures that each company is the official sponsor in their field (e.g. McDonald’s is the official restaurant). Many have speculated: Is it worth the price tag? That’s still somewhat unclear, considering how much is involved. One thing that is clear, however, is that each sponsor has the hokiest ads imaginable and they make me want to lose my dinner. All that faux sincerity and carefully manufactured pride. Uggh. And the worst are those over-the-top implications that there is a correlation between each product and an athlete’s Olympic glory. This year’s sponsors have refused to release the figures of their deals, but they can’t possibly be worth all the money and effort because these ads actually make me want to avoid the products, not go out and buy them. McDonald’s, the mega corporation that spends more an advertising than you would think is humanly possible, never fails to make me cringe with its Olympic tie-ins. This commercial, featuring a starry-eyed little girl meeting Canadian skater Patrick Chan, is the epitome of schmaltz. As if trying to improve the public perception that McDonald’s treats their employees like crap, this ad centers on a worker who’s heading off to Vancouver to work in the athlete’s village during the Olympics. She runs into speed skater Cindy Klassen in the airport lounge and notices that they’re both chowing down on an Egg McMuffin. She proceeds to talk Klassen’s head off about how “fun” it is that they’re both going to be working at the Olympics. The girl, with her incessant babbling, bugged-out eyes and penchant for chewing with her mouth open, comes across as a creepy, single, white female. Her ominous stop-and-chat is all the more unsettling with Klassen’s quick, one-word answers. It’s like she’s fearing for her life. And don’t even get me started about the plausibility of an Olympic athlete eating the greasy muck from McDonald’s. Donald Sutherland, who was also on hand for the opening ceremony, narrates this ad for the Olympics on CTV as if it’s a film. The central chracter is skier Chris del Bosco. The voiceover begins, “A life out of control…”, as we see a young man walking along a dark, murky city bridge. Sutherland goes on to inform us that this is Mr. del Bosco, who “emerged from a troubled and turbulent past to embrace a new kind of danger.” Skiing! It’s a story of “speed, self control and redemption”, we’re told. Sutherland must be confusing del Bosoco with his son Keifer’s character, Jack Bauer, on 24. Oh, and I love CTV’s use of the word “believe.” What a cliché. I think they owe President Obama royalties. What a mess. This ad attempts to show the comradery that hockey produces amongst its fans through a series of short wannabe-whimsical vignettes, but it fails miserably. And the connection of hockey to Coke at the end is lazy at best. I will say this, though: the ad would make a terrific drinking game. Take a shot each time the annoying catchphrase, “He Shoots, he scores” is belted out. You’ll be wasted after a mere minute of drinking. Here’s another commerical with a lame attempt to link a product to Olympic glory. This time it’s a Visa Card. And this time Morgan Freeman is on hand to narrate. His voiceover work has become so ubiquitous by now that it’s gone past being a cliché. At the start, we hear his dramatic words overlaying a slow-mo shot of a sparkling snowflake dropping: “There’s a chill in the air.” Then he says, “But a mighty flame will soon ignite,” and we see the Olympic torch come to life, followed by pictures of athletes doing what they do. Everything is shot with a blue filter in case you missed the point that this is supposed to be the Winter Olympics. “We come together to celebrate the power and the grace…the magic and the miraculous,” Freeman informs us. Apparently, paying for stuff with a Visa Card will bring you closer to the games. Then the ad closes with the classic bandwagon appeal: “The only card accepted at the Olympic Winter games.” I think I’ll use cash instead.